The World's Mightiest Mortal! : An Interview With TVs Captain Marvel - Jackson Bostwick! My blog dedicated to the original Captain Marvel - the World's Mightiest Mortal! An Interview With TVs Captain Marvel - Jackson Bostwick! Jackson Bostwick as Captain Marvel! I grew up watching the Shazam! TV show which premiered on September 7, 1974. 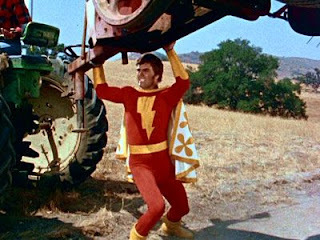 Jackson Bostwick starred as Captain Marvel for the first season and part of the second season. I remember watching the show and reading the Captain Marvel comics that DC had begun printing in 1973. I was given the complete series of the TV show on DVD as a Christmas gift and loved watching Cap in action once again. I reached out to Jackson Bostwick and asked if I could interview him by email for my Captain Marvel blog. Holy Moley! I was surprised and honored that he agreed! Here is my email interview with Jackson Bostwick - TVs Captain Marvel!! Jeff: What was the Captain Marvel costume you wore made of and how much effort did it take to get into it? Jackson Bostwick: The body is Danskin tights. The cape, lightning bolt, belt and gauntlets are silk. The boots are leather. It would take me around 5 minutes to get it all on. Jeff: How physically demanding was playing Captain Marvel and did your background in martial arts help you with those demands? Jackson Bostwick: The different stunts had their own degree of difficulty. Nothing I couldn’t handle at the time. Being 6’3,” weighing in at 217 lbs, and participating in the different martial arts (Judo, Jeet Kune do, Budojujitsu, etc.) plus many other sports, made doing them a hoot. Jeff: You collected and read Captain Marvel comics as a kid, what was it about Captain Marvel that drew you to him as a hero? Jeff: Was there a particular Captain Marvel comic story that you went back to time and again? Jackson Bostwick: The origin legend with Billy and the wizard Shazam in the old deserted subway tunnel. Jeff: What is your favorite piece of Captain Marvel memorabilia that you own and why is it your favorite? Jackson Bostwick: I like the costume I have because of the memories of the show. I, also, like the Shazam sword that C.C. Beck made for me and, also, the Limited Collectors Edition comic that included the origin legend along with various pictures of the show. Jeff: In the TV show, none of Captain Marvel's nemesis (Dr. Sivana, Mr. Atom, etc.) ever appeared. Did you ever try to get them included and written into an episode? Jackson Bostwick: Initially, I tried, but was told that the show was to deal with contemporary problems. When I was asked by Bob Chenault, “What would be a catchy phrase that Captain Marvel would say,” I told him “What is wrong with Holy Moley?” He said, yeah, that’s sounds great. I responded, “Bob, that’s what CM has always said in the comics.” It was spelled in those first scripts every way but correctly (Holey Molly, etc., instead of Holy Moley). No, the writers hadn’t done much research on the nuances of the Good Captain including him being shy with the ladies -- which I attempted to show in a couple of episodes. Jeff: I've read that some of the executives who made Shazam! were not Captain Marvel fans. Did you have to fight with them at times to keep Captain Marvel's character intact and unchanged due to their ignorance of the character's history? Jackson Bostwick: With the Executive Producers ... all of the time. The worst was Norm Prescott. Lou was a little better, but not much. Bob Chenault, the producer for the first year, was great at listening. He and the crew worked with me on how we could pull off the stunts (which I did all of except wrestling with the lion). The trainer did a great job at that, but since he was a good deal shorter that me, the costume kinda fit him like a California Raisin. Jeff: I've read that you've been working on a biography titled, Myth, Magic, and a Mortal. What are your plans for publishing the book - can we expect to see it soon? Is there anything your fans can do to help get it published? Jackson Bostwick: I am hoping that the movie will be underway and I could then release it around the time of the opening. I am, also, debating between self publishing or using a known publisher. Big Lou Ferigno told me to self publish like he did. Of course, there’s the money aspect that that would entail. Just asking for patience from everybody, but I can tell you that it is a great read with many MARVELous photos. Jeff: Have you kept up with Captain Marvel comics today? In today's comics, Billy Batson is portrayed as a smart aleck punk - what are your thoughts on how Billy and Captain Marvel are being portrayed today? Jackson Bostwick: After the issues from the 70’s I have not collected any of the subsequent issues. I read the first script (now scrapped) for the movie by William Goldman and he had Billy in the first 10 pages cussing like a drunken sailor. Terrible! The new look for Cap is more like the demonic alter ego of an electrified Jeffrey Dahmer rather than the “pure of heart,” Billy Batson. ARRG! Jeff: You became friends with C. C. Beck who drew Captain Marvel. Did you ever have plans to work with Mr. Beck on any Captain Marvel projects? Jackson Bostwick: No talk of a CM project with C.C. -- just a very enjoyable friendship. We stayed in contact until his passing. Jeff: What did you enjoy most about playing Captain Marvel? Jackson Bostwick: I enjoyed being able to portray my childhood hero and tried my best to bring the spirit and fun of the Big Red Cheese to the kids of my generation just like Clayton Moore did for me with The Lone Ranger. It’s hard to duplicate the satisfaction of a feeling such as that. Jeff: Do you have any closing thoughts for your fans? 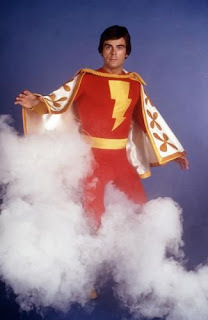 Jackson Bostwick: “Never be afraid of the Universe.” Shazam! I can't thank Jackson Bostwick enough for his time and the opportunity to interview him. As you can see from the interview, he's a Captain Marvel fan and brought that with him as he took on the role of The World's Mightiest Mortal! I hope you've enjoyed reading this interview and that it has brought you new insights into Mr. Bostwick, the TV show, and Captain Marvel himself. This was just outstanding. Thank you for doing this. Thanks for the feedback, David! I had read some other interviews with Jackson and was trying to avoid questions that he had already answered in those other interviews. I also wanted to be respectful of his time - I had a lot more questions but narrowed them down to these! Jackson does a fantastic job interacting with his fans, so I'm very thankful he took the time to do this. Great interview!! I am hoping to meet Jackson Bostwick at a comic con.If he is still doing appearances. Great interview. I wonder if he would consider a Kickstarter campaign for his book. Great interview! Thanks for posting it. Mike's Amazing World of Comics! King Size Comics Giant Size Fun! When The Magic Lightning Strikes!